Sanam Kumara is also known by the name Brahma Sanam-Kumara. He is a Being so advanced, he has to descend in energy and create a body for the Ascended Masters to see him. To quote from the Prophets: “He outshines other Devas in radiance and glory, just as a figure made of gold outshines the human figure”. Sanam Kumara works with the energies of Orion’s stars Rigel and Bellatrix. 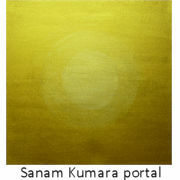 Sanam Kumara's aura has a dark gold centre turning to a light gold at the edges. He is also working for this time with the Ascended Master Lord Lanto.